We've all heard it — megadoses of vitamin C can prevent you from getting a flu or cold as well as cure these illnesses faster if you already have them. Does this common wisdom hold up to scientific scrutiny? Yup, it's that time of year again! Flu season typically "opens" in October, reaching a peak somewhere between December and February, and sometimes not really ending until May . The common cold, which is far more tolerable than the flu but nonetheless makes life unpleasant for a while, is also more common during the fall and winter  — and because it can be caused by hundreds of different viruses, there's no vaccine to save us from that one. So, it's not at all unlikely you'll get ill this fall and winter. When that happens, people — from your grandmother in-law to alternative health websites — will be quick to suggest you "chug vitamin C", whether in tablets or foods. The idea that lots of vitamin C will help prevent illness as well as speeding up your recovery if you're already under the weather is "common wisdom". Is it also true, however? What Is Vitamin C, Exactly? Vitamin C — also called ascorbic acid — is a water soluble antioxidant we all need for healthy skin, bones, and connective tissue. It also helps with the absorption of iron, another very important building block . Not getting enough vitamin C — and we mean really, really not getting enough, not just underdoing the fruit and veg for a week — can make you quite ill with scurvy. Besides an overall feeling of frailty, scurvy can cause bleeding gums, anemia, and skin hemorrhages. Nasty stuff! It's also true that vitamin C has some kind of infection-fighting potential, and that it has an impact on the immune system . How Much Vitamin C Do You Need, And Do You Require A Supplement? The Big Question: Does Extra Vitamin C Prevent And Cure Illness? The impact of vitamin C intake on the common cold — whether you get one, how long it lasts, and how severe your symptoms will be — is pretty well-studied. The only kicker? Not all the studies reach the same conclusion! Some studies show, for instance, that taking a gram of ascorbic acid a day doesn't keep the cold away, but it might just mean you have less severe symptoms, and for a shorter amount of time. Some studies, on the other hand, do suggest that larger doses (up to three grams) of ascorbic acid may help you recover faster . 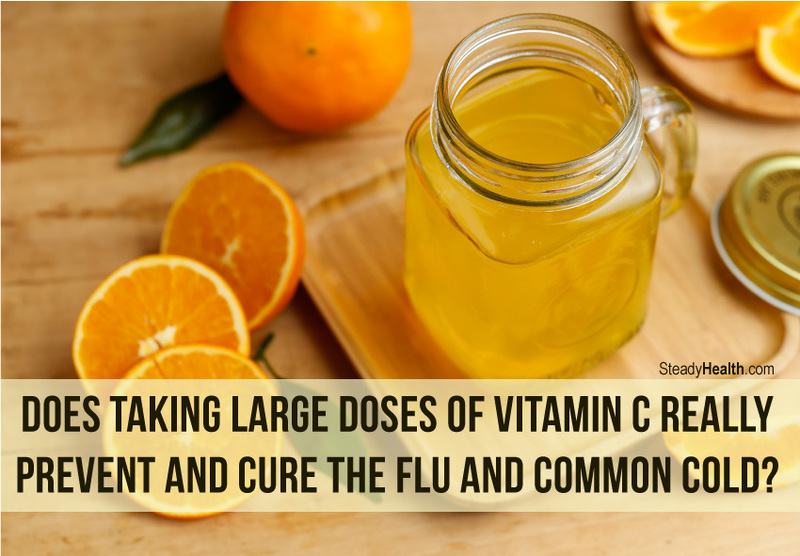 As for the flu, there is some evidence — based on a mouse study — that vitamin C intake may reduce your risk of becoming infected . There's an important caveat, though. Studies have shown that 2000 mg a day is the "upper tolerable intake limit" of vitamin C for adult humans . What this means, succinctly, is that you shouldn't take more than that if you are determined to try to avoid or cure a cold or flu with the help of vitamin C. Megadoses will not help you. As a water soluble vitamin, vitamin C mostly just leaves your body if you take more than you need. By way of urination, of course. But if you really "overdose" on the vitamin tablets (unlike, say, eating lots of citrus fruit), nasties like headaches, kidney stones, diarrhea and constant urination (hey, your body is fighting to eliminate the excess vitamin C! ), and nausea could be waiting for you. While you certainly don't want scurvy, the other extreme end of vitamin C intake isn't very appealing either! You can walk away from all this information with a fairly simple conclusion — eating lots of fresh fruits and veggies rich in vitamin C is a much better option than downing tons of vitamin C tablets. Increasing your vitamin C intake is certainly not the only thing you can do, however. If you want to prevent yourself from catching a cold, research shows that zinc and probiotics may both play a role in preventing colds , while getting vaccinated is the best thing you can do to protect yourself against the flu.